There are many ways to getting br in this game. In the end, it isn't focusing on one thing in particular, but about doing many things. It is the small things that add up in this game. Everything from the angel you use, to the guardians you use, to the;equipment;you upgrade of what aegis you upgrade. Here are some tips that I find useful. 1. Be active. This is the number one tip, hands down. ;If you are active, but don't have vip, you will still gain br faster then a vip that is not active. 2. Do everything. So yes, that kinda sounds like the be active tip, but it is actually rather different. You might be active, but never do guild events or cross server. Everything you can do, helps. 3. Don't give up. Yes, there will be others that are stronger then you, but set a goal and go for it. You'll get there eventually. 4. Find an active guild. ;The different rewards from guild events help you;power up big time. 5. Don't forget to check in daily, for the daily loot, tasks, and rewards. 7. The online bonus is awesome. A must grab- don't forget to collect. Those things are the biggest ones. Now, here is some more information -- and when I say more, I mean a lot more. Before you can understand how to increase your battle rating – br – it might be best to understand how the br is calculated. Yeah, I know, that is a lot to take in. But that is the basic list, and I’ll explain how each works – or at least, what I do with each. The Base attributes are just that- the main stats of your character without all the bonuses. The equipment BR is a bit more complicated. This includes anything done to the equipment in the forge. To better explain, let me explain the forge. The Enhance tab is the first on we look at. This lets you enhance- or level up- your equipment. This gives a nice boost to your stats, and is the simplest thing you can do in the forge. In the enhance area, you can enhance the equipment of all your heroes, as well as your main. Plus, if you have a costume, you can enhance that as well. That costs fashion cores (found in the cross-server shop) as well as gold. Regular enhance only costs gold. But wait, there’s more! There are bonuses to enhancing. If all your equipment is above a certain level, you get a stat bonus. With all my equipment at level 60, for my main, I get an extra 2500 HP, 500 PATK, 500 MATK and 200 agility. The Socket Tab is the next stop. This is where those gems you gain in gemology are used. Every piece of equipment you have can hold up to 5 gems. You have to unlock different sockets (to hold the gems) by using socket rods. Once a socket is unlocked, it stays unlocked. The Refine Tab is the next stop. Here you can use the refining stones you gain in jackpot to upgrade your weapons even more. Like enhance, there are bonuses to getting all equipment refined past a certain level. It is something that is important not to forget. The Enchant Tab Is actually rather new for me. There is a new section gained in spire at a certain level where you can fight to gain enchant stones, for different equipment. It is similar to upgrading, as each time you enchant it adds to the blue orb. The fuller the blue orb gets, the higher your chance of an enhance. First level costs 5 per enhance, second costs ten, third costs 15, fourth costs 20. I’ve yet to get past that. Enhancing adds a percentage to how much the equipment increases stats. For example, at level 1, my conquest staff gains 1500 atk. At level 2, my helmet gives me a bonus of 10k HP. At level 3, my mail gives me a bonus of 4500 PDEF. All in all, some really nice boosts. To synth equipment, you need the materials. For a level 40, that means a lower level equipment of the type you want to synth, a print – that you can buy in the arena shop, shards for whatever item you are synthing, and Adamantium. Plus gold (to pay the blacksmith working to craft the item, or so I assume.) For a leve 60, you need the same things, only you no longer need Adamantium, you need gold bars. The materials can be collected in the Erebus. Another thing, if you have more than one of the ‘lower’ equipment- say, 3 staffs. There will be a checkmark beside the equipment button. If you click that, you can select who’s staff you are upgrading. This way, you can equip only one heroes gear, instead of accidentally upgrading a different heroes, then having to switch all the gems over. To Synth an item you need a certain amount of an item, and gold. If you hold your pointer over the items shown, you can see what it is you need. Simple enough. To Synth a Gem you need 3 gems one level lower. There is a 75% chance that they synth will work. You also need gold. It is possible to use synth scrolls to ensure that a synth works, however those can be hard to get. Personally, I only use the synth scrolls on level 5 and above. The Exchange tab is a biggie. Here you can pay gold to exchange one type of gem to another. Or one type of equipment for another, of the same level – very useful if you just got a new hero, and they use a dagger instead of a sword, or something like that. Saves you a lot of enhancing. Personally, I collect gems, exchange them all for one type, then synth them together. This way, with more gems to work with in a particular stat, I have a better chance at a higher level gem. Every day I pick a different stat to focus on. That really helps boost my BR. There is one more part to equipment though, the Runes. Runes are gained through runes in the spire, or sometimes buying them in the voucher store, special events, ext. ; By upgrading your player and your hero’s with runes, you gain some huge boosts in stats. Personally I focused on my main for the most part, but I am currently working on upgrading the runes for my heroes as well. Once I unlocked the second section of spire, I put all the runes I get from the second section, into my heroes, and all the ones I get from the main spire into my main. I’ve seen a huge jump in br from doing it that way. Skill BR is gained through increasing your skills. If you go to the character menu, there is a tab that says skills. A different levels you unlock more skills. You need different skill books for certain stages in the upgrading, and each upgrade costs a certain amount or warsouls. The more you upgrade your skills, the better! Here are some ways to get warsouls – Clash of Might (CoM), and garden. I cannot stress enough how important the garden is! Most people just don’t think to do it, or pass it off as unimportant. A lot of vips don’t bother unlocking extra garden plots or enhancing the soil but let me tell you something, gardening is THE BEST way to get warsouls and to get exp potions for your mount. A might fine source of gold too. A couple tips about garden – If you are online a fair bit, use the 2 hour seeds. If you’re not on as often, use the 2 hour seeds. If you need to go to sleep, use eight hour. If you are going on a road trip, then yeah, you can use the 24 hour ones… but that’s about the only time I would recommend it. Why? Well, you get 20 exp for your tree per planting, regardless of size of seed. Then you get 30 exp her harvest- 50 exp per seed. The higher level your tree, the faster you can harvest, and the more you can harvest. Right now, a 2 hour seed only take me an hour and ten minutes- an hour if the seed is watered- and it gives me almost double the listed harvest amount- all because I have my tree at a high level. The guild bonus helps too, of course. Astral is basically the bonuses you gain for leveling up. Don’t forget to activate these! Title. Titles of nobility that a person is able to gain. Every title gives a bonus to BR, and you can’t unlock the angel Nyssa until you are at a certain title. So, how to gain prestige? The arena is a great place to start, and sharing feasts with your guild is sure to help as well. This one is a long one! 1. Guild boss. It's a good idea for the guild to set up a time to do the guild boss, so that people know when to expect it. The guild boss is a nice gold bonus for people, and can be a big help. 2. Feasts. ; Feasts are important to attend, and to host. You can get more shards for horse, prestige, and other nice treats from it. Prestige can be a pain to gain, but this is a sure-fire way of getting some. 3. Gauntlet. If you can make the gauntlet, do. The gold rewards, and the guild honor rewards are both very useful. 4. Twilight Clash. ; Whatever guild you are in, you want to do twilight clash. This gives you a chance to gain honor, emblem shards, and just have a good time. If no one is showing up for twilight clash in your guild, it might be time to find a new guild. 5. Guild Shop. So it's a shop. Yes, that sounds kinda obvious but there is some great stuff in there. The synth scrolls are a nice catch, but the most important item in there is the timeskip scrolls. You can only buy 2 a day from gold shop, and when you start rebirthing heroes, you'll be wanting a lot of them. 6. Guild class. Donating to the guild doesn't just gain you honor, at certain levels of donation you can upgrade your class. Higher class means higher guild wages, and also means higher guild bonus. Yes, there is a br bonus to being in a guild. The higher level the guild, the higher level the bonus. So donating to the guild is a win-win for everyone in the guild. Nice, huh? 7. Donating to Guild. ; Didn't I just mention this? Not quite. I mentioned that it is a good idea, but I didn't mention there is more than one way to do it. The basic way is to go to the 'donate' button right beside the guild events and click that. There, you can donate gold towards the guild level- earning honor badges by doing so. While that is great, the guild bonuses are just as important. Guild bonuses include nine different things that can be upgraded. A smart thing to do is to upgrade guild lvl, then upgrade all bonuses to level, and repeat. This gives everyone in the guild a higher income of prestige, gold, honor, exp in drills, and even better plant production in the garden. Nice deal! The dragonsoul game is similar to the gemology, though I have found I get better souls by merging multiple lines with one move, instead of more gems. I’ve still not confirmed that though. Save up to get the better souls, those give the better bonuses. You can equip ‘souls’ to your character, and to your heroes. The souls level up by ‘devouring’ each other. Really try to balance the elements you use, because getting the elements above a certain point grants you special skills. Your mages might magically revive, or your rogues stun the enemy’s entire front row. Not everyone does this, but I’ll say right off the bat that you should. You gain br boosts, get to gather items towards a wedding garb- a mighty fancy outfit. (poofy on girls, looks like an Elvis outfit on guys.) So what’s not to like? Get out there and get working on an in game marriage, you’ll be glad you did. This is the same as the base attributes for main. Same as for main, and I doubt you want me to type it all our again. Ah, now this is an important one. When you click the train button, on the lower taskbar it opens up to a training window. That is the spiritsoul training. With training you can increase your hero’s stats, and at certain levels unlock bonuses. ;Definitely something to do for all heroes. Same as with main character. The element is not mentioned in the BR breakdown, in game, but it DOES contribute to BR. Every time you increase an element, you increase the elemental damage the hero deals, as well as the elemental resistance the hero has. That is on top of whatever attack that hero already has. Same as for others. 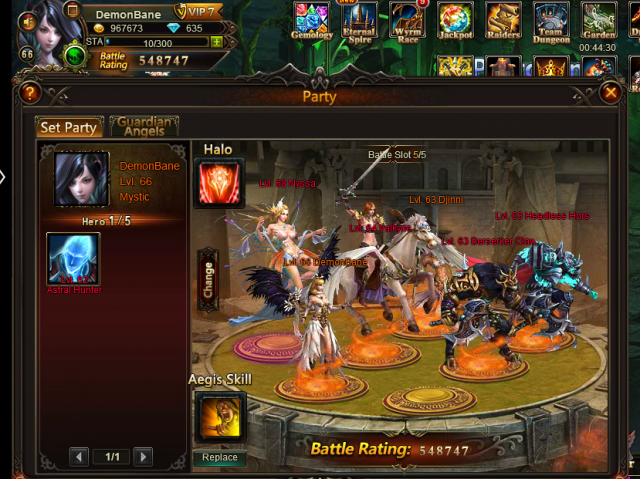 The Angel has a base battle rating, per level. Higher level, higher BR. The Aegis shards, used to upgrade the Aegis, are gained by fighting the zodiac. These are very useful. The different aegis skills can turn the battle in your favor, or save you from a particularly nasty hit. The best part about the aegis though, is the bonus each upgrade gives to your angel. Two angels of the same level and name might be very different because of the aegis. Personally, I try to keep my aegis levels even. The effects do stack, and you get more bonuses faster, if you upgrade evenly instead of focusing on only one or two of the aegis. You can upgrade your angel’s star level. This gives a HUGE bonus to stats. Get all guardians to at least level three, and get your top two to lvl 5… then go from there. The guardians give a very nice br boost. All three of these have been described above, already. Well, I’ve gone through all the BR as best I can, but there are a couple other things I think I’ll note. First off, Angel Worship. Angel worship gives a small, but nice boost to different stats, and the best part is that the enemy can NOT see what worship you have active, nor does the worship effect the visible br. This is one of the reason the shown br is not always as accurate as some would wish. Hot events is another thing. Sometimes a hot event shows at reset, sometimes at noon. Either way- do them. The loop quests. People might groan when I mention those, but consider this- the gold you get for buying the items is more then you actually spend, talking to someone doesn’t use up any stamina, you gain stamina for every 5 loops complete, you are getting gold and exp for the loop, and for the actual battles you do, and at the end of it all you get a shard for a horse, and other goodies. Long explanation short, the person that does the loop will level faster than the person that does not. More leveling, faster unlocking of next skill tier, and faster astral boost. And all that takes is a little time. Tidal Pool. While it doesn’t give br directly, you can gain different items that goes towards br increase. Raiders. These give you the soulstones and blessing stones needed for soulrise and upgrading. A must do. Team Dungeon. Gold, skill books, exp. Need I say more? Wyrm Race. Gold. Angel tears. – Nice. Hero Tavern. This is where you can get herosouls to hire better heroes. You can even fire heroes, once you are done with them to get some herosouls in return. I do suggest keeping one lower level hero though. Cerub stones. The higher lever cherub stone you have, the bigger bonus your guardian angel gives the person it is attached to. I suggest using those dragon crests you gain in team arena to buy the level 2 cherub stones. Synth then together to get a higher level one. Keep doing this, you will eventually be able to make some nice, big ones. Quiz. Held at 1pm server time. (in Thornwall, at least) The quiz is an easy way to get some gold. Team arena. Nice way to get those dragon crests. Arena. The things you need to buy prints. If you want to upgrade your weapons, you have to do this. Cross-Server. This can get you a lot of nice stuff. Vouchers for the shop, among other things. A must do. It is also the only place you can get the fashion cores, if you are hoping to upgrade your costumes. Plus you can buy medals with the winnings from cross server, you should check that out. Bling. Yeah, bling. If you go to the character page, click clothing you will see what you currently have on. If you click bling, you can see what sets of outfits you own. Activate your bling for bonus br. Emblem. This is another guild bonus. You gain these shards in the Twilight Clash, and can buy them from the guild shop. Though they are more expensive than the timeskips, and the timeskips give a better result, faster than the emblem shards, so I go with buying those. There are the different events that pop up, as well. Pretty much everything in the game can increase your br in some form or another. In the end, the most important thing is to have fun- I hope this explanation has at least given you a decent idea of how the br is figured out, and raised. Any views or opinions presented in this strategy are solely those of the author and do not necessarily represent those of the League of Angels staff.